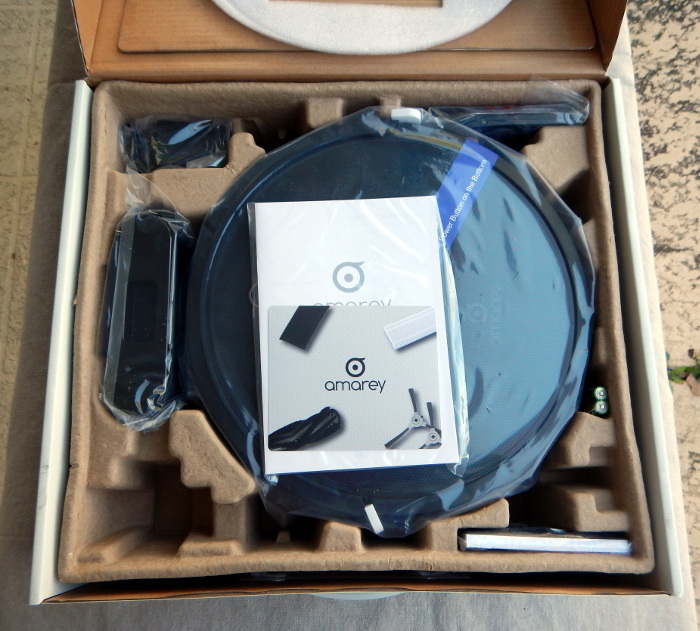 REVIEW – I’ve been looking at robotic vacuums for some time and hadn’t decided if one would really work for us or not. 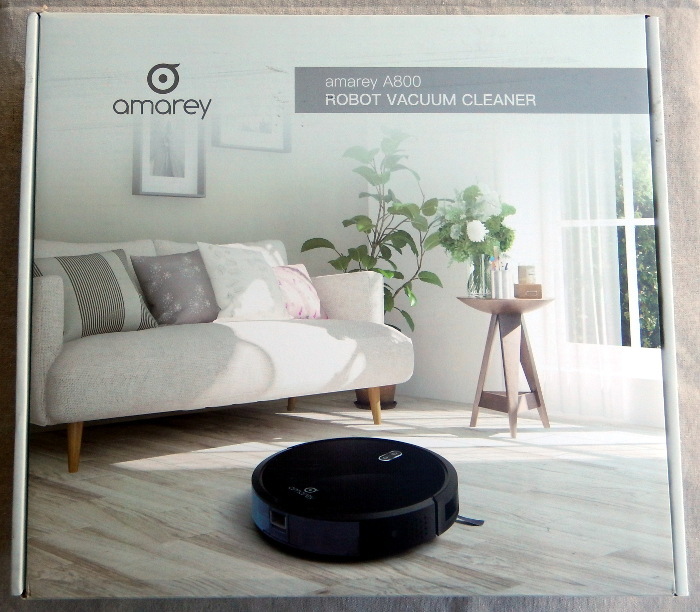 So when the opportunity to review the Amarey A800 robot vacuum cleaner came up, I decided to bite the bullet and try one out. 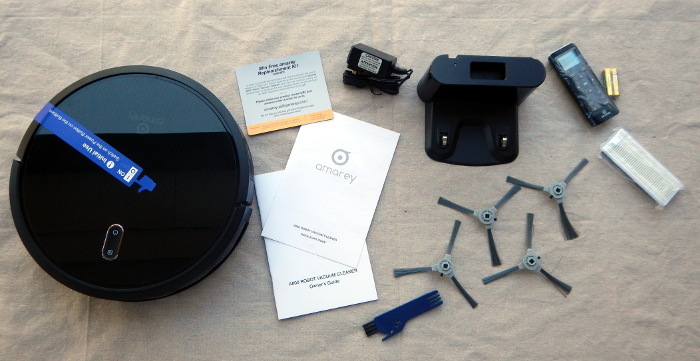 The Amarey A800 is an entry / mid-level robotic vacuum which shares its form factor with the majority of other robotic vacuums on the the market–a giant hockey puck with whiskers. The A800 the mid-level offering from Amarey and offers some advanced features not found on the manufacturer’s other models. 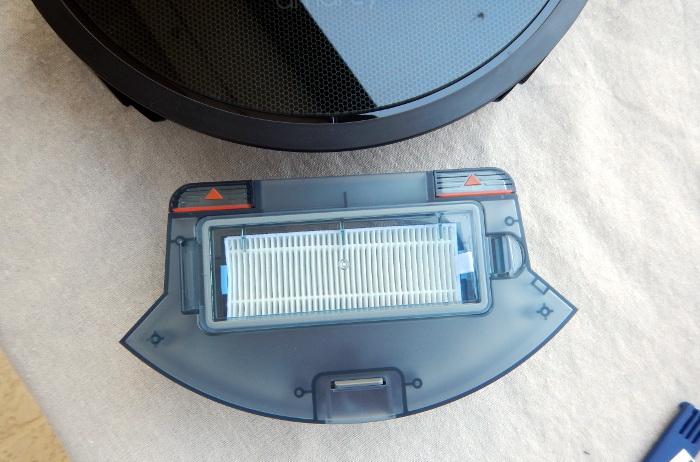 The A800 model is aimed at households with pet hair and associated pet debris. The A800 is offered in two color schemes: black and white. 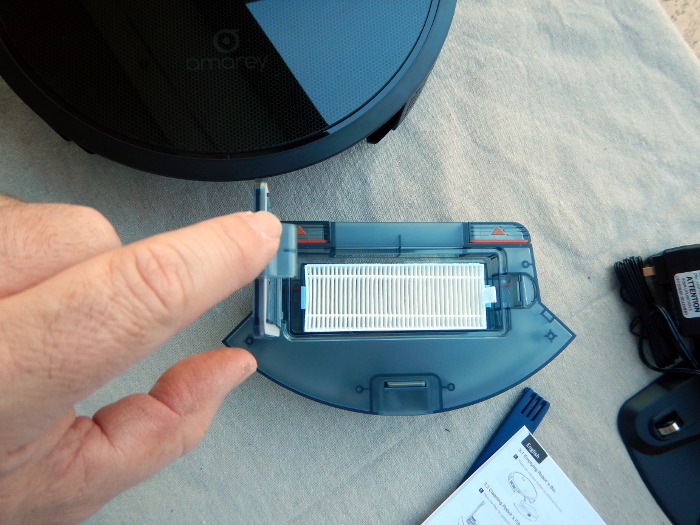 As mentioned above, the Amarey A800’s intended market is households with pet hair and debris. The addition of a second suction setting (“max”) is important to its performance in this area. 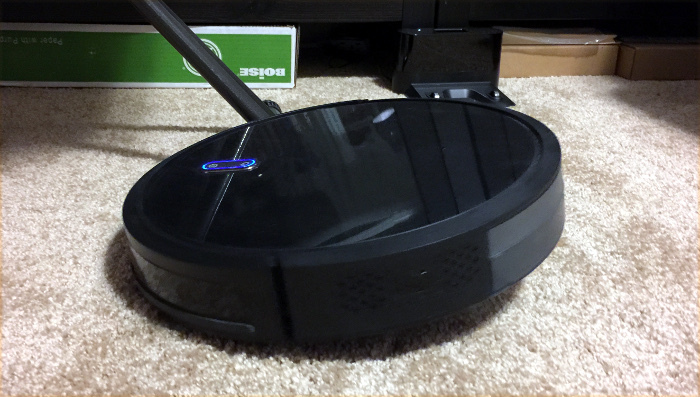 The physical design of the A800 is unremarkable and follows the hockey puck with whiskers design pioneered by iRobot’s Roomba. My initial thought upon unpacking my robot vacuum was, “This needs some glow-in-the-dark eyes to really set it off.” My wife quickly squashed (sorry about the joke) that idea. My younger son insisted that the robot needed a name. He rejected several (sorry for some of the jokes that follow) including Nature Abhors, Dusty, Spot, and Oops. We finally agreed on V.I.N.C.E.N.T. (I’ll leave the tortured derivation to the reader). I will interchangeably use A800 and VINCENT to describe the vacuum below. The A800 has twin bumpers on the front-left and -right and cliff sensors in the very front of the unit to help prevent a tumble down the stairs. An easy-to-access dust bin is on the rear of the unit. It is removed by pressing down on a recessed button and pulling the bin out. The bin is equipped with a permanent debris screen and a two-stage replaceable filter which consists of a sponge-like material (which is washable, but ultimately a consumable) and a corrugated paper filter. 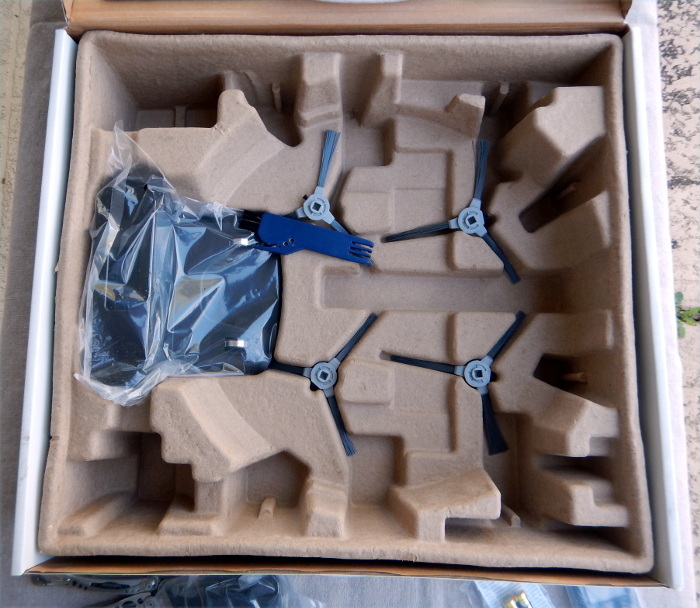 Spares for the two consumable filters are provided. Setting up the A800 involved the removal of some shipping blocks that protect the bumpers / switches and some adhesive panels that kept the dust tray and some other parts secure during transit. I also had to press-fitting two edge brushes onto the appropriate axles on the bottom of the unit. The red master power switch on the bottom of the unit must also be turned on before the unit can be charged and put to work. Once the initial preparations were completed, I had to locate a suitable place for the charging dock and charge the A800. 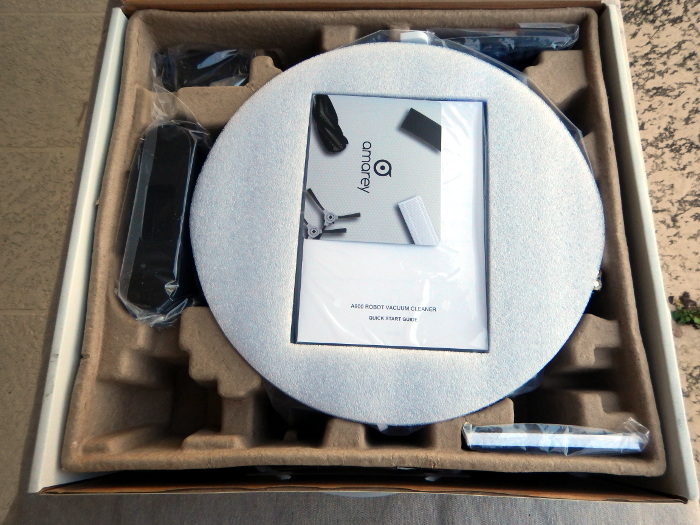 The instructions suggest having a clear 6 foot by 6 foot half-oval in which the charging base is to located. This was by far the most challenging part of the setup. 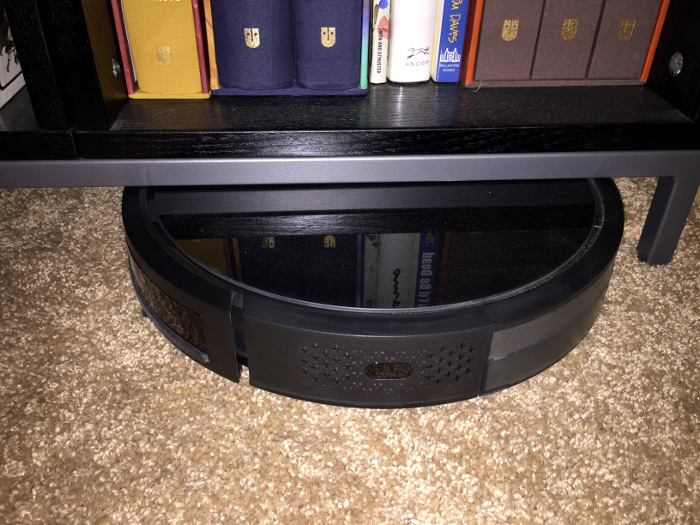 I ended up placing the charging base in front of some of the bookcases in my office. While the A800 was charging (about 3 hours), I put the batteries in the remote and set the clock on the remote. I also took time to read through the manual to discover what all of the various symbols on the remote’s buttons meant. I will discuss the importance of the remote shortly. After reading the manual, I soon discovered that many of the important functions of the robot vacuum are triggered only by the remote. The only controls on the A800 itself are buttons for starting / pausing a general cleaning cycle and telling the robot to return to base. 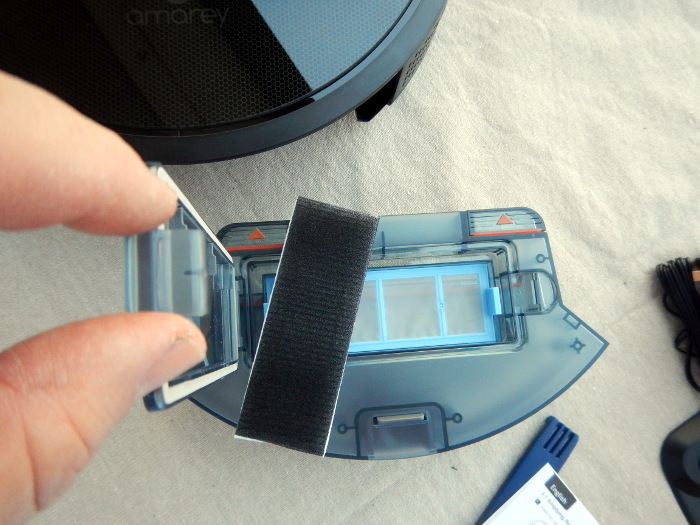 The remote may be used to manually drive the A800, sets the cleaning mode, and schedules cleaning cycles. We are currently between pets, but among two adults, one with long hair and one with a beard, and two teenage boys we generate a lot of hair and debris. Testing revealed that the VINCENT does a fine job of picking up debris that may be missed by casual vacuuming and debris in areas not easily accessible to traditional vacuums. I found that in our house, the standard level of suction was not adequate for our medium-pile carpets or area rugs, but was fine for hard surfaces. The “max” suction setting did a very good job removing debris from our carpets. I am still amazed at how much debris VINCENT picked up during testing in a routinely vacuumed carpeted hallway, a less routinely vacuumed kitchen, and my office, which, let’s face it, usually only gets vacuumed when I spill something. I attribute this performance to the pedantic nature of the robot as compared to my “it’s good enough” style of vacuuming. 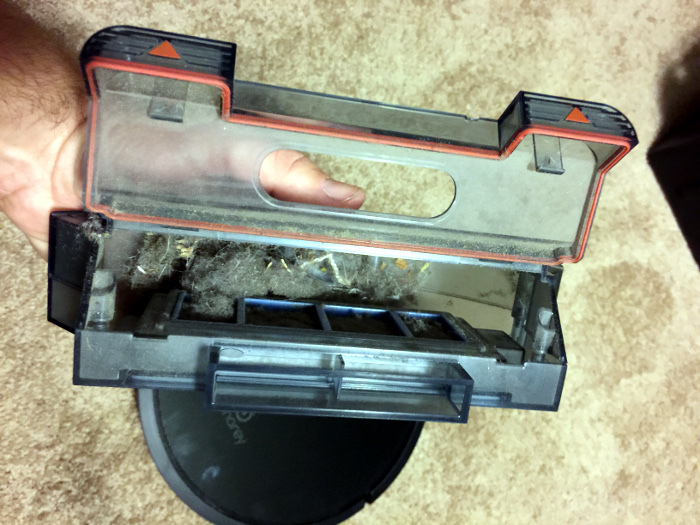 VINCENT’s dust bin is easily removed, as stated above, and is easy to open to empty. 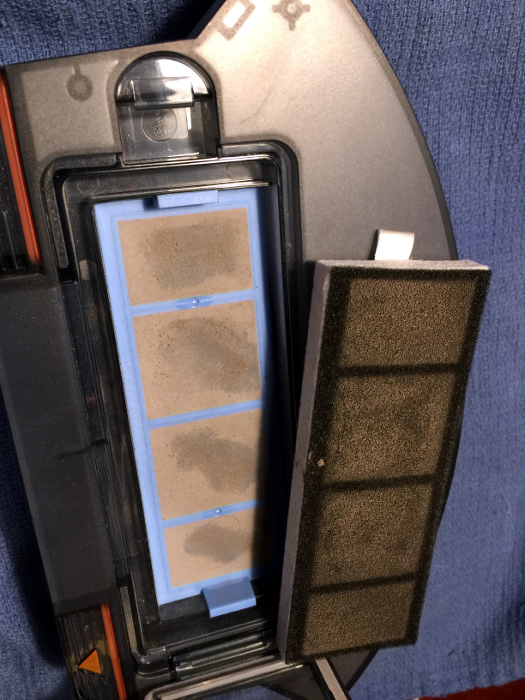 After not checking the filters for the first few cleaning cycles (the manual recommends monthly), I found that suction decreased significantly because the debris screen was choked with schmutz. Now, I check the debris screen and black foam pre-filter every time I empty the bin. The photo shows the results of a quick 30 minute clean on max suction. When set for standard cleaning, the VINCENT runs for about 90 minutes before attempting to return to its charging base. On the max setting, VINCENT will only run for about 50 minutes before requiring a charge. Charging times are on the order of 3 hours. 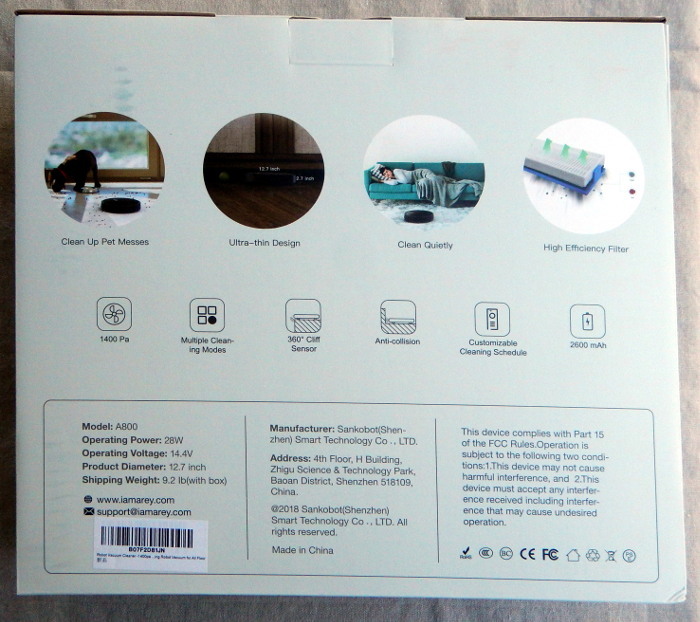 The A800 has the following cleaning modes which can be accessed via buttons on the remote. The A800 can be run on a schedule or on-demand. 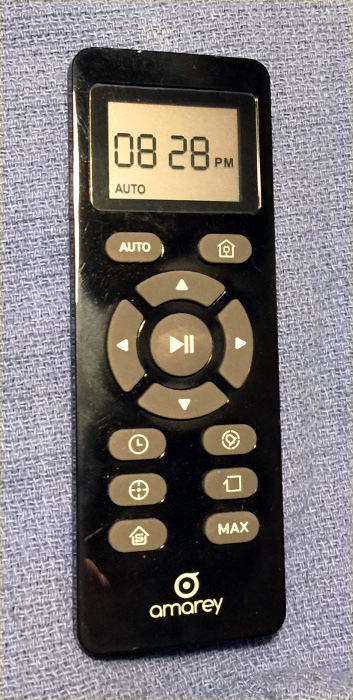 Scheduling is handled by the remote, so the remote must be within line of sight of the A800. During my evaluation, I found that VINCENT has trouble avoiding dark-colored (black and black-brown) objects, avoiding low-clearance areas (I am reminded of the infamous “truck eating” bridge of YouTube fame), navigating loose, lightweight throw rugs on slick surfaces (wood floor), and negotiating cords and horizontal tube legs / feet on pop-up tables. All of these objects and conditions were encountered during VINCENT’s initial testing in my office and front hall. I made no preparations other than placing boards at the end of the hallway and in the back door of my office to keep VINCENT somewhat corralled. During the first few test sessions, VINCENT wedged itself under on of my cabinets three times in 10 minutes, high-centered itself on a rag rug after pulling the rug up underneath its body, high-centered itself on a small pop-up table’s tube feet, dragged power and low-voltage cords out from under my secretary desk (used as a charging station for our myriad of iDevices), and became trapped between my desk and trash can where it rattled around for 5 minutes trying to extricate itself. After these first few sessions, limits were placed on where the A800 could travel through the strategic placement of relatively immovable objects, like my trashcan (vintage JustRite rag can), chairs, heavy books, and for one troublesome spot, a pair of antique cloth-wrapped brick that are normally used as doorstops. An Amazon review described preparing for reliable use of the A800 as being similar to toddler-proofing a house. I think that is an apt description. This brings us to the navigation system on the A800. It doesn’t have one. It follows a set of simple algorithms for free roaming and recovering from collisions that approximate what I call a dunkard’s walk–following a slightly arcing path until a collision occurs and then rotating to change direction and trying to set off again. This can lead to humorous, or frustrating, pirouettes while the robot tries to navigate out of confined spaces. Support for scheduled cleaning, on-demand cleaning, and spot cleaning. Despite its foibles, the A800 does a good job of cleaning small spaces with limited clutter and well-controlled cables. I would recommend the A800 for people with studio / loft / 1-bedroom apartments or confined spaces where clutter-minimization is practiced. I found myself using it as a one room at a time vacuum rather than letting it run on its own schedule. After my experiences with VINCENT, I am definitely sold on the concept of robotic vacuums. 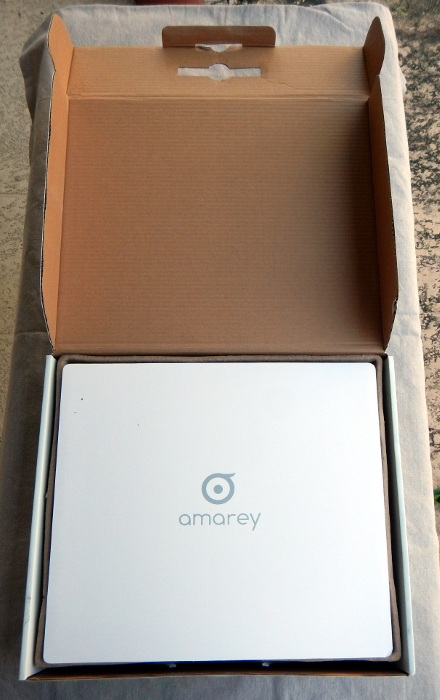 Source: The sample of this product was provided by Amarey.